There are big differences in cables, however, even affordable cables may show excellent results, if used correctly and for the right applications. We believe you should have free choice. Therefore, we have an extensive range of cables. We even offer ready made cables according to your needs (sorry, return for credit is excluded then). Kimber Cable is the entry into high-end. Only the bare minimum is required: no plugs, since each additional contact reduces the sound quality. You still prefer ready made cables? Upon request we'll make up the cables for you using WBT connectors. In addition to the cost for the material we charge EUR15.00 for labour. Please enquire! 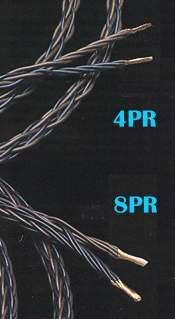 Manufactured and marketed successfully since 1979, the 4PR has an outstanding price / performance ratio. It consists of 4 brown and four black insulated wires that are twisted together. The 8PR has 2 x 8 insulated wires that are suitable for higher current or longer distances. The VS series combines pure copper wire with an insulating sleeve made of PE. The cable reproduces a soft sound, allowing a relaxed listening without suppressing essential details. The 4VS consists of 4 grey and 4 black insulated wires, totalling a diameter of 2 x 2.6 mm2, while the 8VS has total diameter of 2 x 6.6 mm2. The TC series combines pure copper wire with an insulating sleeve made of Teflon. The combination of material used represents the optimum. 4TC is very popular. 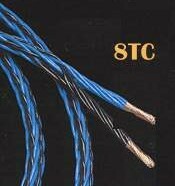 The 8TC is a top class cable for high current or longer distances that is still in moderate price range. The 4TC consists of 4 blue and 4 black insulated wires, totalling a diameter of 2 x 2.6 mm2, while the 8TC has total diameter of 2 x 6.6 mm2.